Colette and Alison are unlikely cohorts: one a shy, drab beanpole of an assistant, the other a charismatic, corpulent psychic whose connection to the spiritual world torments her. When they meet at a fair, Alison invites Colette at once to join her on the road as her personal assistant and companion. Troubles spiral out of control when the pair moves to a suburban wasteland in what was once the English countryside. It is not long before the place beyond black threatens to uproot their lives forever. 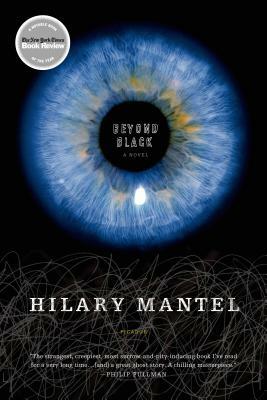 This is Hilary Mantel at her finest--insightful, darkly comic, unorthodox, and thrilling to read. Hilary Mantel is the two-time winner of the Man Booker Prize for her best-selling novels, Wolf Hall, and its sequel, Bring Up the Bodies—an unprecedented achievement. The Royal Shakespeare Company adapted Wolf Hall and Bring Up the Bodies for the stage to colossal critical acclaim, and the BBC/Masterpiece six-part adaption of the novels aired in 2015. The author of fourteen books, she is currently at work on the third installment of the Thomas Cromwell Trilogy.